Elegant, evocative, and exquisite, our Square Glass Clock captures attention in any room it is placed. The simple yet contemporary design fits the decor of most settings. It is powered by a battery, so there is no obtrusive cord hanging from the clock, and it may be placed anywhere in the room. 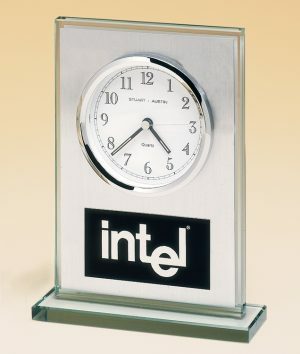 A six inch, clear glass plate stands vertically between two columns and holds a round 3” timepiece. Silver trim encloses the white face which contrasts with the black hands and black Roman numerals that mark the hour. A second hand identifies each moment of the day. This extraordinary clock may be personalized. An engraving plate provides room for three lines of text, and all of our engraving is free of charge. Give it as a gift, a retirement present, or as an award. 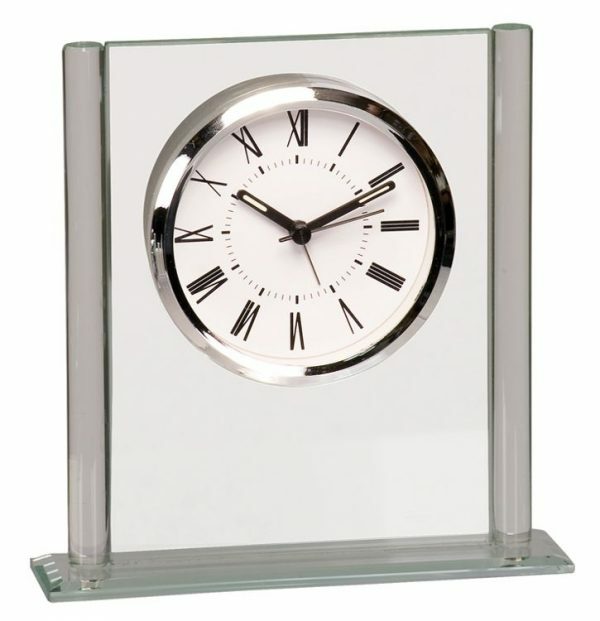 Order our Square Glass Clock (item GCK002) just to watch the expression of the lucky recipient.